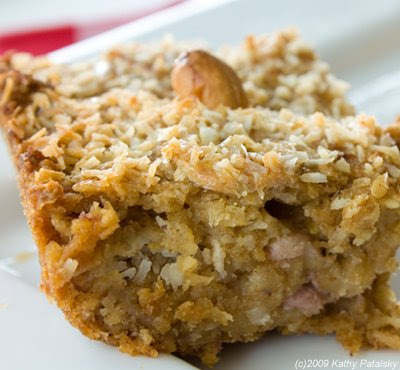 Oatmeal Bake Tiki Squares. Kid-Approved Breakfast. Breakfast for adults means a hot coffee, chai or cappuccino. A fruit salad, savory breakfast sandwich, homestyle potatoes, protein shake, or a blissful muffin. But kids (of all ages) like things a lot simpler than a big breakfast spread. Heck, even a bowl of oatmeal, nut butter and fresh fruit can seem to lack the simplicity that kids crave. 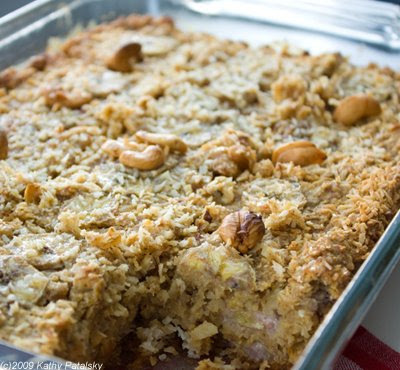 Well how about the healthy-yummy taste of oatmeal, fruit and nuts baked into a fun square? Yes! A Square Meal in a Square. These fluffy scrumptious squares have it all. (And guess what, they are a lot healthier than those pop-up toaster squares.) 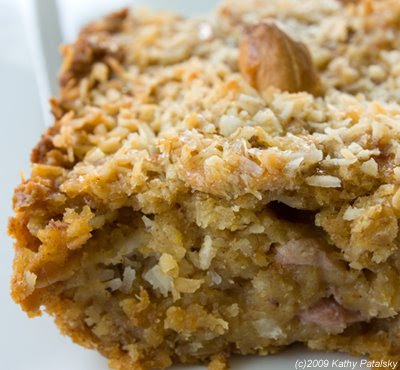 My Tiki Squares have oatmeal, soy, almond, coconut or hemp milk, fiber-rich cashews, potassium rch bananas and even some healthy flaxseed four mixed into these maple and agave-sweetened squares. 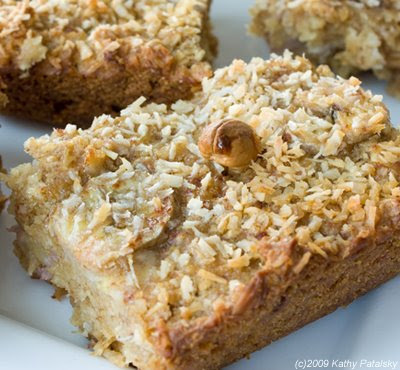 Toasted-on-top coconut flakes give these squares a fun tropical tiki feel. Yummy, healthy and both kid and adult approved. 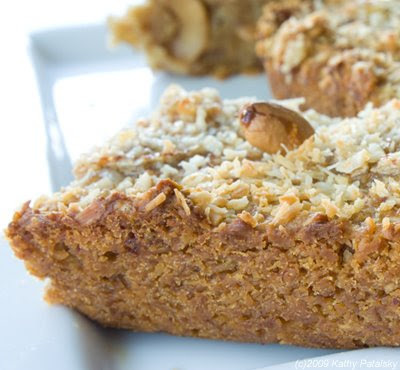 You can bake them once and eat them all week. Easy as dropping something into the toaster! 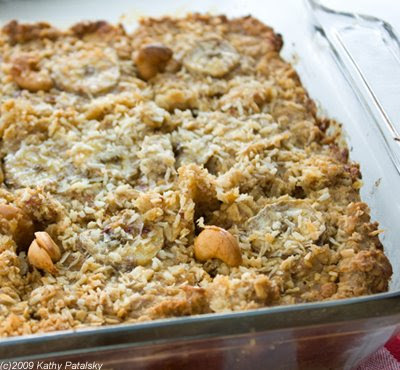 3 Tbsp coconut flakes, handful cashews, a few banana slices and 1 Tbsp maple syrup. 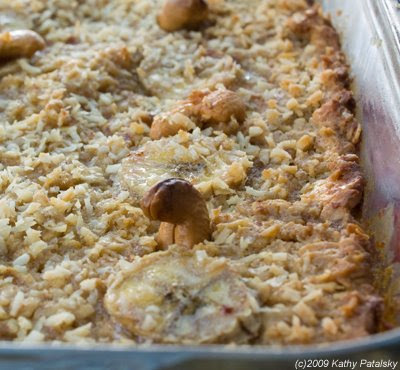 Fold in cashews, bananas and coconut flakes. 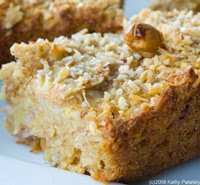 Top with coconut flakes, a few banana slices and dot with cashews. Bake at 350 for 40 minutes or until the center of the bake is firm. Allow to cool for a half hour. Serve with fresh fruit . 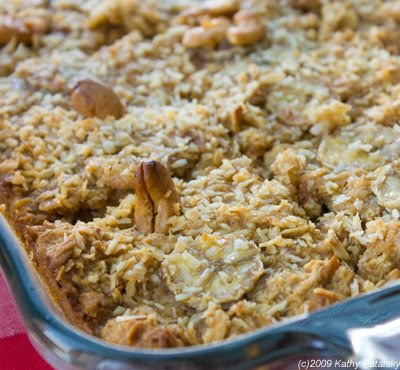 You can even get creative with this recipe by using different versions of fresh fruit, nuts, and seasonings.